Today’s artiste is a callback to two previous Advent Calendar selections. As terrific as his song parodies are, nobody can build a successful 35-career in music just by piggybacking onto current hits. He’s a legitimately talented musician and performer. Long, long ago, my favorite tracks on every “Weird Al” album stopped being the song parodies: instead, I look forward to the style parodies. Like this one. I’ll get the crass part of out the way first: this is a nine-minute song and in terms of metric tonnage per dollar, there are few greater values on the Amazon MP3 Store. The true selling point, though, is that it’s a masterful attempt to write a new song based on Frank Zappa’s musical DNA. It sends you scrambling to see if the song is actually based on a Zappa original. I can easily be fooled like that. Even when I was 18, I wasn’t really plugged into what 18-year-olds were listening to at the time. When “Straight Outta Lynwod” was released, I didn’t even recognize “Trapped At The Drive-Thru” as an R. Kelly parody until months later. What marks “Genius In France” so immediately and unmistakably as a Zappa style parody? Hell if I know. I lack the music geek’s vocabulary as well as the musicalolologist’s suede elbow patches. I can’t do anything more than cite the heavily-layered melodies and the sudden downshifts in tempo. More than anything, though, it has Zappa’s sense of play. The song isn’t out to tell a story or establish a mood so much as it wants to bat around an idea for several minutes. Here’s the thing, though: Yankovic does this on every album. 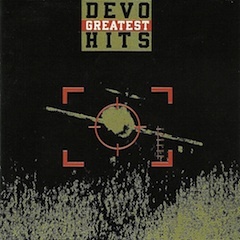 DEVO frontman (callback #2) Mark Mothersbaugh once claimed that Yankovic recorded the best DEVO song ever: “Dare To Be Stupid,” from the album of the same name. Just as with “Genius In France,” this is a clean hit. It seems like it’d be cheap to even call it a “parody.” Yankovic lifts nothing — it kind of evokes the back-melody of “Big Mess” — and exaggerates nothing. Yankovic just has a highly-refined ear for a band or composer’s signature elements, and enough chops as a composer and an arranger to articulate those concepts into brand-new pieces. He’s as legit as they come. I’m tempted to compare him to a Brill Building composer. He’s definitely capable of hearing during breakfast that Phil Spector was looking for an uptempo number for the Ronettes and then writing something perfect for that group by lunch. Or maybe he’s like Sir Arthur Sullivan (of “Gilbert And…”) fame. Sullivan would be staring at the libretto for “Iolanthe” in front of him and think “You know, this score could really use something sort of Mendelssohn-ey right about here.” And off he’d go. But “Weird Al” Yankovic’s true musical ancestor is Carl Stalling. He scored nearly every cartoon that Warner Brothers produced during its Golden Age. Every seven-minute opus had to mix original themes, popular melodies of the day, and flatly functional phrases to underscore that Wile E. Coyote has just spotted the Rocket Boomerang circling back towards him. I’ve always wanted to see what Yankovic would do with a movie score. I bet he’d be excellent at it because the task seems to call for the same unique talents he puts into play on all of his original composition. Writing music that’s both Original and Evokes A Familiar Tone is like holding both Tea and No Tea at the same time…but that’s how you win the game. Above and beyond all of that: I just flat-out love this song. If I didn’t know who Zappa was, I’d still be humming “If I were any dumber/They’d have to water me twice a weeeeek” after fishing crushed-up iPhone parts out of the garbage disposal. 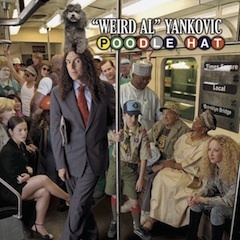 “Weird Al” Yankovic: a real goddamn musician. So long as he keeps making albums, I’ll always find money to buy them. That’s been the case since way back when I bought cassettes with paper-route money. I don’t think any other performer has maintained that position in my musical tastes even half that long. Listen to “Genius In France” on the Amazon MP3 Store. As always, this link is embedded with my Amazon Associates code. If you click it, anything you buy during that Amazon session will result in my receiving a kickback in the form of Amazon gift credits…which I shall spend foolishly and extravagantly on fun things.